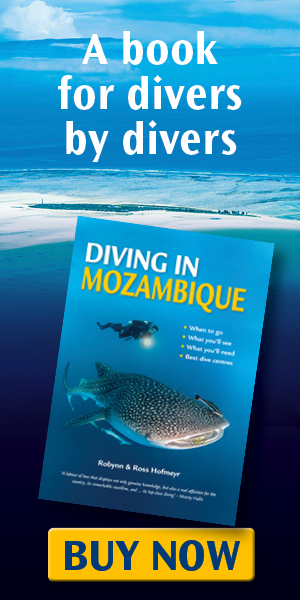 Labour of love and quite a few years work: my mother Robynn and I have written a guide “by divers for divers” to the dive resorts of Mozambique. 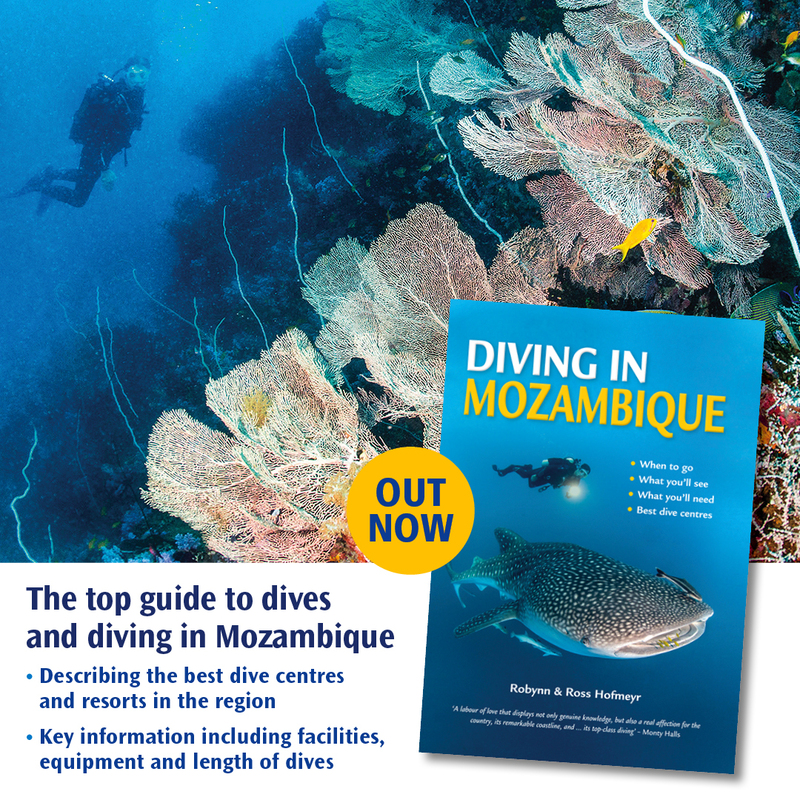 This was more of a challenge than anticipated, as the sociopolitical climate in Mozambique means that there is a continually shifting landscape when it comes to dive operators, and some significant regional differences. Although there are some very well established resorts and operators, many of the smaller, newer or more exclusive venues are unknown, and no-one could give an accurate estimate of the actual number. The book has been thoroughly researched but is filled with actual impressions and practical reviews of the many resorts, and is worth acquiring simply for the hundreds of original photographs from a plethora of contributors. It is available from September 2017 from various online vendors, and SA bookstores. Click here to go to the publisher’s site to purchase a copy. Anaesthesia, Critical Care, Emergency Medicine, WhatAmIReadingToday? 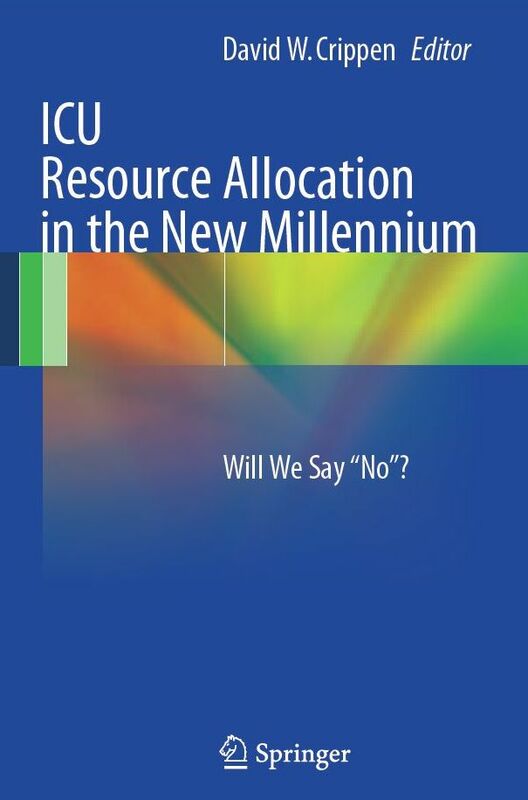 Released this month by Springer, edited by Dr David Crippen, a neurointensivist and the “Fearless Leader” of CCM-L (the International Critical Care Mailing List and discussion group) and including two chapter on ICU in South Africa, in the past, present and looking towards the future. I am particularly proud to have contributed the latter (Chapter 22). NYSORA – the New York School of Regional Anaesthesia – has a fantastic collection of articles on specific nerve blocks, guidance techniques (including ultrasound), general pointers and other links. There very well illustrated step-by-step guides to many of the blocks are brilliant adjuncts to learning new techniques and brushing up on doing a block you haven’t used in a while. I’ve never looked back after I adopted some of their tips and tricks. Highly recommended. They also sell a hard-cover book that covers lots of the material, if you prefer to read with something in your hand. The US National Library of Medicine’s Visible Human Project provides access to colour 2D and 3D images of real human anatomy, and is the next best thing to having a cadaver laboratory at your fingertips. To get the most of this data/imagery, you’ll need to use a viewer or browser of sorts. The Ecole Polytechnique Federale du Lausanne’s Visible Human Web Server allows you to do specific slices, 3D reconstructions and more. You’ll need to create a (free) login. For quick, three-dimensional and completely interactive study of anatomy, you have to check out the BioDigital Human site. It offers a zoomable, rotatable, layerable, disectable, labelable, x-rayable and cross-sectionable 3D anatomy model for you to explore. I have just begun to tap the advantages and of this for personal learning and teaching; my favourite so far is dissecting off one or two neck structures to show the interscalene approach to the brachial plexus and then using the search function to switch to X-ray view highlighting the phrenic nerve. Pure awesome. I’ll try to keep on posting sites that I enjoy. Please feed back any info you think worth sharing, or pass this on! I want to talk about fear. We let it hold us back too much. Fear is a funny thing. I always think of it as a disease: it is natural, evolves with society, it can affect us at any time, everyone has different tolerances and triggers, and it is infectious. Of course, you will get over it, and it is treatable. Sounds like a disease to me. – Nathan Mullins, “How to Amputate a Leg”. I think most people live with too much fear, and worse: they live with a great fear of fear itself. To paraphrase a friend: “Know your pathology”; know it and don’t let it rule you. I realised I haven’t posted anything about what I’m currently reading for a long time. Hence, here is a post… with a difference. The ‘serious’ stuff that I’m reading (some paeds anaesthesia from Smith’s and Miller’s; The Naked Pilot by David Beaty, a work on the human factors in aviation safety; and “Come Up and Get Me,” Joe Kittinger’s biography of the early days of the space race) is all fascinating, but I have to admit that a lazy Saturday afternoon does lead me to partake in a guilty pastime: online comics. I’d thought I’d share a couple of my favourites, in case you’ve never met them and are missing out. …if you learn it to become bilingual, *grin*. It turns out that any two languages will do. Having been born into a very English-speaking household, making the transition to studying (and often practicing) medicine in a very Afrikaans environment was entertaining, in a darkly-humourous-while-deeply-uncomfortable way. Once, when being interviewed in Afrikaans and asked to describe my abilities to understand and speak the language, I accidentally but likely very accurately exchanged the word for “fluent” (vlot) with the word for “rotten” (vrot). However, the foundations laid in school (where it was a compulsory second language) and six years of an immersive environment has led to me becoming a passable Afrikaner in most situations…and assisted in the acquisition of a beautiful wife along the way. The perpetual debate for bilingual parents has always been whether to raise children from the outset in one language, and then introduce the other later, or to speak both from the beginning. Common wisdom suggested the former; research is now emerging to suggest that bilingualism is good for the brain in all sorts of ways. This article from the New York Post summarises it nicely. PS – If two are good, are three better? Hau, eish! I stumbled across this article examining the risks of various extreme sports from a statistical viewpoint on the BBC Future webpage. It makes makes brief, interesting reading… and I was particularly attentive as I enjoy several activities that are mentioned. 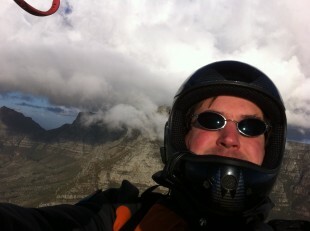 Bottom line: BASE jumping and high-altitude mountaineering are a fairly effective way from dispatching yourself from this mortal coil (pun intended), whereas sky- and SCUBA-diving are fairly equally safe. Of course, this analysis doesn’t assess the potential physical and mental health benefits to be gained from spending lots of time getting exercise in the fresh air (or water!). For a wider discussion, see the preceeding piece on micromorts as a measurement tool. The Expedition Medicine team (www.expeditionmedicine.co.uk) have put together a nice review of field management of femur fracture, written by their medical director, Dr Amy Hughes. 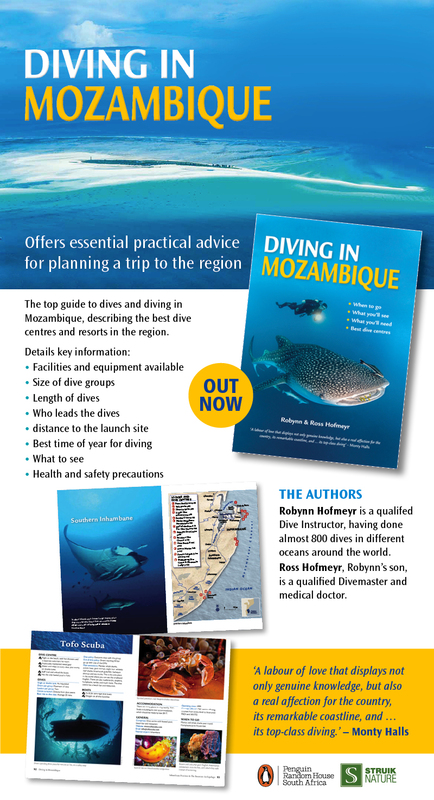 In particular, it has a good step-by-step pictorial guide for applying the Kendrick Traction Device (KTD), one of my favourite pieces of kit. The degree of haemorrhagic compromise caused by even a simple closed femur fracture shouldn’t be understated: Expecting 1500ml of loss into the compartment, this by definition puts the patient into at least Class 2 shock. While it is good to see wilderness/expedition medics au fair with hypotensive resuscitation, we must not lose sight of the fact that maintaining adequate perfusion trumps the fear of dilutional coagulopathy and ‘clot-popping’, especially in the face of delayed/lengthy evacuation. It’s a fine balance, especially in the wilderness. Kudo’s on a good blog, folks. I have resigned myself to the fact that I will never be a world-famous blogger. This is not due to a lack of the ability to write (well, ‘document’, perhaps, as true writing implies artistry) nor a dearth of material (the world around us is just full of quirky stuff) but rather my utter laziness. It takes a serious effort and some time out of the day to place posterior on pew and pen to paper… metaphorically speaking. In any case, with that admission out of the way, I have decided that for as long as the gumption lasts I will try to post a very brief blurb on whatever wilderness medicine literature or related information I happen to be reading. Even if it’s just a link or two, this will hopefully be a small contribution to the field, rather than just my meandering musings. Hence, here is ‘What I’m Reading in Wilderness Medicine Today’: Salt-Water Aspiration Syndrome. SWAS (I’ve just decided that is the acronym from now on) is reasonably well documented in the literature and should be familiar from any talk or chapter on drowning/near-drowning. You will likely recall that two different clinical pictures emerge dependant on whether a patient has aspirated fresh or salt water; major concern in the former is the loss of surfactant and resultant atelectasis and lung damage, while the latter is characterised by pulmonary oedema, fluid shifts, metabolic acidosis and later hypoxia, depending on the inhaled volumes. The original paper describing the phenomenon is attributed to a Dr Edmonds in 1970 (see Edmonds C, A salt water aspiration syndrome, Mil Med 1970 Sep;135(9):779-850; I have not yet been able to acquire the article). Why am I suddenly interested in this? Well, yesterday we were geocaching out along the coast. 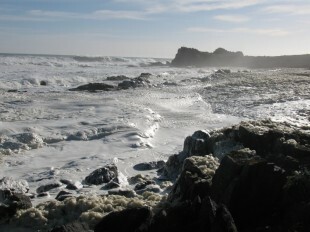 There was a big sea running, and the onshore wind had piled sea foam in great masses along the shore. We suddenly realised that the Labrador had gone missing, and after 15 minutes of running around calling (there were ostriches nearby, and I thought he might be chasing them) we realised that he had possible tried to run ‘over’ the foam and was now ‘submerged’ amongst the rocks… or had gone into the wild sea and was almost certainly already dead. We both plunged into the foam, wading and feeling with our feet. 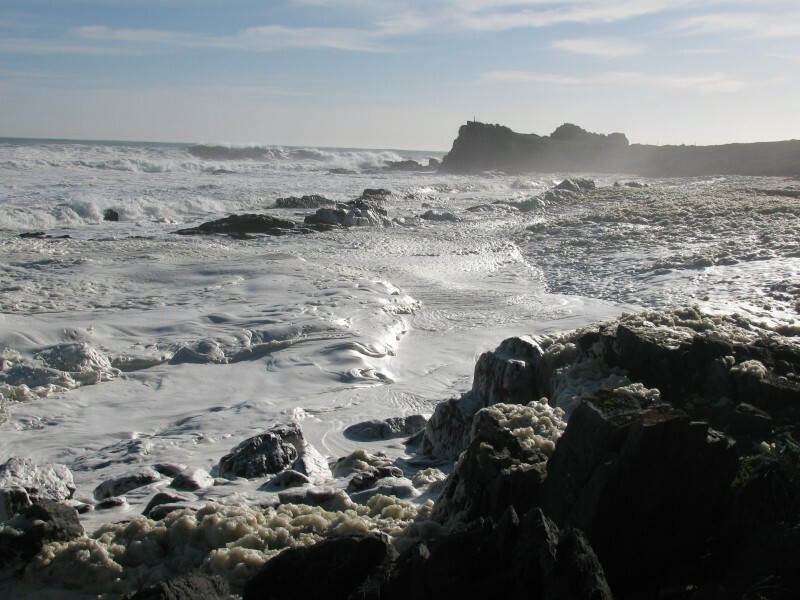 The foam was discoloured from particulate matter and very salty, and new ‘waves’ threatened to swamp us as the wind brought more from the adjacent sea. You will imagine my relief when I felt a furry body beneath foam which was up to my neck, and the furry body turned out to be a live but very sick dog. He had been trapped under the surface for 20 minutes. Initial symptoms were bloodshot eyes, coughing, tachypnoeic with a very wet chest with ronchi/rales and hypersecretion. He was still able to ambulate, however, and so we hoofed it to the car and sped off back to Cape Town and the veterinary hospital. By the time we arrived an hour later the cough had settled but he had developed a harsh wheeze throughout the respiratory cycle. He was admitted on IV fluids and prophylactic antibiotics for monitoring, and 24 hours later is gradually improving. Mild cases of SWAS (not uncommon in divers) generally resolve with rest within a few days, while more severe cases require positive pressure ventilation (a very good response to CPAP/PEEP has been observed). Expert opinion and the literature I’ve been able to track down concur that there is no role in for corticosteroids. This is by no means an exhaustive review, but please drop me feedback if you find it informative and/or useful. I have not yet been able to find a case report of aspiration/pneumonitis from sea foam in either human or canine in the literature yet, so if you are familiar with such a case please let me know. 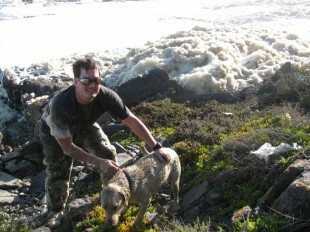 Last (happier) picture – the dog and I after we found him.